This summer, it's settled, you will not miss the festivals in your region and you may even stray further away. Nothing then is more pleasant than getting away on a hot, sunny summer day with a picnic basket in your hand. For those occasions, La cena musicale offers you three picnic menus to enjoy before (or during) the concerts. Do you want to mark the national holiday of our French cousins? Pick a French music concert like the one at the Orford Arts Centre on July 13, for instance, with Canadian pianist Anton Kuerti and the Colorado Quartet. They will be presenting two watershed works from the early twentieth century French repertoire: Debussy's G minor Quartet and Frank's F minor Quintet. Pack your basket with imported speciality cheeses, liver paté, rillettes (potted meat), French bread or fougasse (flat bread), and naturally a bottle of wine to charm your palate without spoiling the concert that will follow. You could also bring a cold roasted seasonal vegetable soup (see the recipe below). For dessert, some Madeleine or sable cookies would go extremely well with a honey-and-saffron-seasoned fruit salad. This recipe should be prepared on the eve of the concert. Roast vegetables available at your market on your well-oiled BBQ grill or in the oven at medium heat. You could for instance, include a large onion cut in quarters, variously coloured peppers seeded and sliced in halves, an eggplant cut into 2.5 cm slices, a few seeded tomatoes sliced in halves and 4-5 unpeeled garlic cloves. Remove the vegetables when they are well done. Let them cool and peel the garlic cloves. Place everything into a blender adding 4 cups of tomato juice, 2 cups of cold water, 75 ml olive oil, 30 ml white wine vinegar, fresh thyme and rosemary and maybe a dash of Tabasco. Chop everything roughly. Adjust the seasoning and leave in the fridge for at least 8 hours. Italian opera still knows how to touch the hearts of many a music lover. Next July 19, an exceptional evening is scheduled at the Lanaudière Festival, which is celebrating its 25th anniversary this year. Karine Gauvin, Marie-Nicole Lemieux and Chen Reiss, under the accompaniment of Les Violons du Roy, will be singing in a concert version of Glück's Orfeo and Euridice. Why not go for an Italian theme and treat yourself to a full plate of antipasto? It should include cold cuts: salami, prosciutto and capicollo are the classical varieties. An assortment of Italian cheeses will accompany the latter: pecorino, asiago or gorgonzola, for instance. In addition you may add the indispensable marinated vegetables: artichoke hearts and mushrooms. 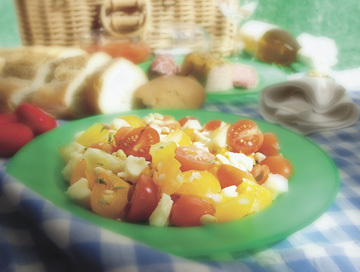 A refreshing tomato and mozzarella salad (see recipe below) and an Italian crusty bread will wonderfully round off la cena. There is no lack of Italian wines to get you to sing a few selected arias during your meal. For dessert, which you might decide to have during the intermission, go for a few biscotti and strong coffee (brought in a thermos). Cut up 16 small currant tomatoes (combine yellow and red tomatoes for greater impact) into quarters. Add some fresh mozzarella di bufala in pieces about the same size as the tomato bits. Finely chop up a green onion and 8 basil leaves. Mix them into the salad along with a small handful of pine nuts. Prepare your salad dressing (50 ml of extra-virgin olive oil and 20 ml of balsamic vinegar, salt and pepper to taste) and set aside in a small airtight container. Pour on tomatoes just before serving. The magnificent Charlevoix region has irresistibly attracted you and you decide to attend a concert with well-known flautist Emmanuel Pahud at the Domaine Forget on June 22, for example. Take this opportunity to stuff your basket with local products bought the afternoon before the concert. You could include some ripened specialties from the Maurice Dufour cheese producers, such as the Migneron de Charlevoix, a semi-soft washed cheese or a Ciel de Charlevoix, a raw milk blue-veined cheese. (1339, boul. Monseigneur de Laval, Baie Saint-Paul. 418-435-5692). Do call on the Fumoir Charlevoix as well, where you will find salmon, trout, scallops and other smoked seafood delights but also duck products such as liver terrine, rillettes and magrets (duck cutlets). (25, rang Saint-Mathilde, La Malbaie. 418-665-6662). You will also want to taste the local cider, mistelle or sparkling cider at the Cidrerie du Verger Pedneault. (45, rue Royale Est, Isle-aux-Coudres. 418-438-2365). A delicate and refined dessert awaits you at the Finesses de Charlevoix. (378, Saint-Godefroy, Les Éboulements. 418-635-1407). No matter what your selection, it will make your evening memorable! Three types of picnic baskets are available in the stores. The most traditional is the wicker basket, which is romantic but not always suited for a long trip in the heat. For such occasions you can find insulated bags that will keep your food fresh. These bags are slung over the shoulder and some models are especially designed to carry one or two wine bottles (often in a separate pocket). Home furnishings and camping equipment shops carry such products. A few companies specializing in the field have their own web sites. You will find everything you can dream of at: www.picnicbaskets.com, www.picnicfun.com or www.picnicstore.com.